A row of shops along busy Queens Boulevard went up in flames early Thursday, the FDNY says, engulfing several businesses and sending nearby residents and their pets into the cold before one of the buildings collapsed in a heartstopping blast. 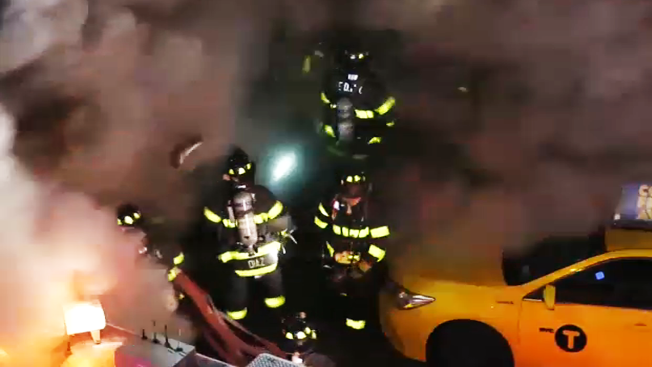 The five-alarm blaze broke out at around 2 a.m. Thursday on Queens Boulevard, near 45th Street, in Sunnyside, according to officials and video from the scene. Firefighters said the flames appeared to have started somewhere on the first floor in a restaurant and quickly spread. Then an explosion collapsed one of the buildings; video captured a blast of smoke billowing into the street, as firefighters disappeared in the smoke. "We felt it shake and we could certainly hear it," said neighbor Gabby Goldstein. "It was pretty alarming." 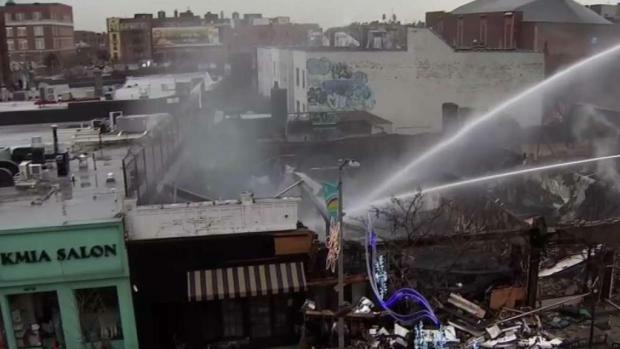 A building exploded after a huge fire on a busy commercial strip in Sunnyside, Queens, catching firefighters in its path, dramatic video shows. Incredibly, no one was seriously hurt. Ida Siegal reports. One witness at the scene told News 4 that she heard sirens for about an hour when she realized what was happening. "I felt the building shake and I started to smell smoke," Nicole Zeinert said. "So I ran in to get my husband and we grabbed our cats and coats and just ran outside." Fire officials said at least 12 people, including seven firefighters, were injured. Incredibly, all of the injuries are minor. At least six businesses, including a restaurant, a UPS building, a lingerie store and hardware store, have been destroyed, video shows. The FDNY is still working to put out the blaze. Twenty-five fire departments and more than 160 firefighters responded to the fire. Many of the businesses destroyed were part of the community for decades. A neighbor recalled the hours he and his family spent at one of the businesses, an eatery called New York Style Eats. "The owner always sat there, always greeted you, and there would be a guessing game, what were you gonna eat that day," said Sunnyside resident Han von Rittern, tearing up. "But he knew you by name. That's one of the last two places in the neighborhood that still have that heart. And that's what hurts." 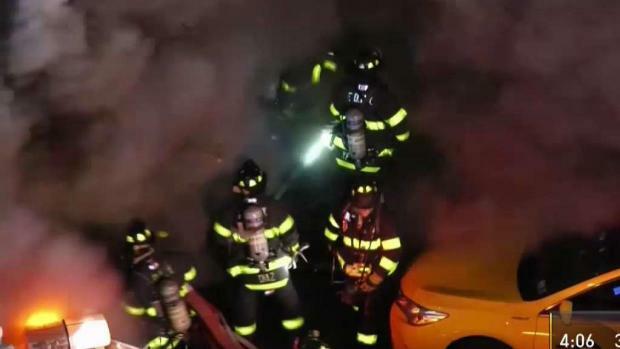 Nearly 200 firefighters responded to a fire that tore through a Queens strip mall on Thursday. Ken Buffa reports. "This is my home, as it was my mother and father's home, as it was my grandparent's home," Mary Caulfield wrote on a fundraising page called Sunnyside Fire Relief Fund. "The pain goes deep." Councilman Jimmy van Bramer said about 70 people have lost their jobs as a result of the fire. In a tweet Thursday morning, state Sen. Mike Gianaris, whose district includes Sunnyside, said the community "will do what it can to help rebuild." Fire officials were warning people to avoid the area because of the heavy smoke suffocating the streets. It's not yet clear what may have sparked the blaze. A spokesperson for UPS said customers who have a mailbox at the UPS store that burned down should contact the UPS store on Vernon Boulevard in Long Island City to pick up their mail or file claims.